Do you have the gift? The super power of being able to stay focused. To keep working and progressing toward your goals despite all the distractions and competing demands for your time. If you struggle with it, don’t worry. The ability to get and stay focused isn’t something some people are born with, and others are doomed to battle with throughout life. 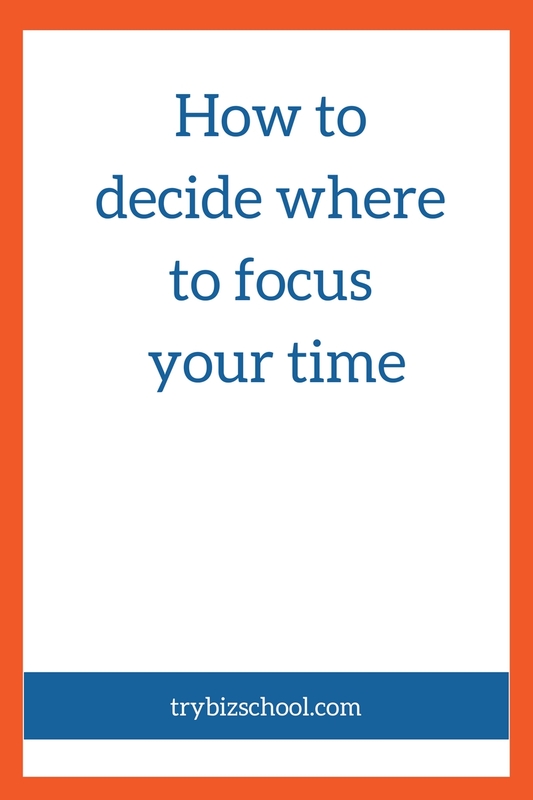 All you have to do is apply the right strategies to make it a whole heck of a lot easier to stay focused on your must-do tasks. Here’s one way to do it. A few years ago, I went to Maui for a girls trip. We had an amazing time, and I’m excited to return back to the island one day. But in the months leading up to the trip, there was one goal that guided much of my action: be bikini-ready. I love the beach. And to me, Maui meant a ton of beach time. And because I succumb to vanity from time to time, I wanted to make sure that I felt comfortable, rather than self-conscious while wearing my swimsuit each day. And even though working out is a part of my weekly routine, I was super focused on making sure that I got all my workouts in as the trip got closer. My friends and I were even diligent in getting some exercise in each morning before hitting the beach while we were there. When you’re clear about your goal, it makes it easier devise a strategy to help you reach it. And when the plan is specific, then it’s a whole lot easier to stay focused on doing the things you need to do to execute it. You’ve got to define what you want. It’s the foundation with which you’re able to build everything else on in terms of what you do and how you spend your time. As important as this step is, many people skip it. As a result, they often build a business that looks nothing like the one they dreamed about. And they end up frustrated too. No bueno. To help you develop the focus you need to build your dream business, you’ve got to have a detailed view of the business and the life you want. Check out this interview with Jesse Krieger (transcript below), author of Lifestyle Entrepreneur. Jesse shares how to define the business you want and marry it with your ideal lifestyle. Then you’ll have the foundation you need to focus your energy in all the right places. Because this is such an important topic, I’m unlocking it from the vault it’s been in since the Entrepreneur Survival Summit finished. Welcome back to the Entrepreneur Survival Summit. I’m your host Sonia Thompson and we are continuing along with phase three of this conference the way you think about your business. One of the cool things about being an entrepreneur is that you are the boss. You are in charge of your business, the way it runs, who you work with and even the lifestyle that your business enables you to live. The challenge with this is that many entrepreneurs really just go and create a job for themselves. Their business runs them and it even dictates how they live their life. No bueno. In this session, Jesse Krieger who wrote the book on Lifestyle Entrepreneurship is here to share how you can build a business that supports the life you want to live. Let’s get to it. Here’s Jesse. Hello Jesse, thank you so much for joining me today. How are you? I’m good Sonia. Thanks for having me on. I’m doing great. All right, let’s go ahead and dive right in. What exactly is a lifestyle entrepreneur? It’s a term that we’re starting to hear more and more about these days. Sure. From my perspective, certainly a lot of people identify with being a lifestyle entrepreneur more now than perhaps ever before. My own definition and what I was thinking and writing my book Lifestyle Entrepreneur, is it’s really somebody that blends their creativity with their business sense and put another way without using the terms lifestyle and entrepreneurship and the definition following the things that you’re really interested in and passionate about and turning those into or leveraging those in some way to bring different products or service to market that are valuable to other people and that you can transact in a way where it doesn’t really matter where you are in the world. That allows the freedom that a lifestyle of travel and opportunity. Got it. What exactly does being a lifestyle entrepreneur look like for you because I think some people may get it in theory but what does … what has that been like for you over the past few years? It’s an ever evolving thing. I usually find like you’ve mentioned one quote that I have in terms of lifestyle and entrepreneurship being like two strands of DNA almost that influence each other and impact each other. A couple of examples would be like we were talking just before this interview, there was a time when I was really studying Mandarin Chinese intensely like four or five hours a day and I had the opportunity to go over to Taiwan and live there for the summer and study in Taipei. In the process, I had maybe four or five hours of my day dedicated to studying Chinese and there is a whole set of goals associated with doing that but then I also had the second half of the day to go explore. When I took up cycling and ended up riding all over Northern Taiwan which played forward into later joining the cycling team at UC Berkeley when I got back but also was working on writing the first draft for my book just sitting in coffee shops and stuff in between bike rides and Chinese study sessions. Taken as a whole, any given day, any given week, I’d be involved in two or three different activities that had some level of continuity to them but not just sitting at a desk in an office for eight hours a day working on a business. Got it. I know for a lot of people that may sound like a dream for them and they might be wondering how is that possible because I think a lot of times you have entrepreneurs who are working in their businesses and they just feel like there’s not enough time to just do basic stuff and get a full night sleep and just do regular stuff in life let alone being able to spend time doing a lot of I want to call recreational activities but spend more time doing life stuff. Why do you think so many people struggle with not being able to build a business that allows them to bring so many elements of themselves given that freedom? That’s a great question and the good news is it’s an option that’s available to anybody. Before I lived through the experiences I have, they were a dream of mine. I think the really differentiating point is how committed are you to your dreams in the sense that you’re willing to get creative, nontraditional unorthodox in finding ways to achieve them and if that’s your mindset, then it starts to shift your thinking away from being constrained or trapped in a situation instead of looking for the door or the window that can take you out assuming that you’re in a situation you’re not happy with now in your career or life. I had maybe two or three coaching clients at the time so I jump on Skype one or two hours a day, three to four times a week. I put that business on maintenance mode in terms of working with entrepreneurs to help them start businesses of their own and the lifestyle component was more forward at my life in the time. There’s been other times when I’ve been hunkered down and I’m building something or starting a new business or doing a new venture and I won’t be traveling and living bouncing around every single day because it’s difficult to get something started when you’re unrooted to a specific place. In terms of how do you get the money to finance things like that, again thinking a little bit creatively, a little unorthodox through the school that I was going to, I accessed maybe two or three different grants and basically free money for Americans that want to study Chinese using these … almost anything you can find some angle where you can subsidize what you want to do to a certain degree and still have and be integrated to your broader life goals. In terms of how do you get the money to finance things like that, again thinking a little bit creatively, a little unorthodox through the school that I was going to, I accessed maybe two or three different grants and basically free money for Americans that want to study Chinese using these … almost anything you can find some angle where you can subsidize what you want to do to a certain degree and still have and be integrated to your broader life goals. Just from a purely business sense, it really does come down to just looking at the numbers of like if you have some level of predictability, if you’re doing coaching or if you’re doing group training for example, then you know at a certain number of clients, this is going to bring you a certain number of revenue and with that comes a certain time commitment and when I’m in that space of working with a client or doing media like this, it’s just about being 100% present to what’s going on there. We all have the same amount of time in the day but even after two or three hours of really intense coaching work or doing media or focus, I think lifestyle entrepreneurs differentiates itself from other types of business by just cutting the thread and going and doing something completely different for the next few hours and actually switching up and having a lot of variety day-by-day which for me I’m sure I’m not the only one that feels this way but I need that variety to keep me expedited and motivated for everything that I’m involved in. You said a lot of good stuff there. I want to go back and dive in to one thing that you said more at the beginning and I think it’s a notion of you made a decision that you wanted to live your life a certain way and then you built a business that supported it. Is that really the steps in being able to build a business that … a lifestyle business? It’s a chicken and an egg question. It’s like for example just to put … we’ll just use this whole studying in Taiwan thing as a launching point to explain the broader context of how I wound up there. Years earlier, I was on a personal development program in London for the summer and a friend and I, we met an entrepreneur who had lived in Shanghai for a couple of years and had done business over there. I got this crash course blast into a new culture, new world and that was the actual catalyst that made me think, “Oh wow, maybe it’s worth looking into this further.” Once that seed is planted, it matured into what ultimately became having my USB superstore business that manufactured in South China and Asia, concurrent with studying Chinese language at university and doing a study abroad program. I don’t really want to commit months or years of my life into this. It’s just being open to serendipity and in some cases just continuing going down the path of inquiry and exploration beyond what maybe other people would but to tie that all together, it’s like once you go down that path far enough, this whole concept of identity and lifestyle entrepreneurship is once somebody perceives you in that new role that you’ve stepped into, then it becomes very real. Three years later I’m there and I can talk to people in Mandarin, I don’t need to use English, I have a business that’s operating there and I’m a student at a top school in Asia and then all of a sudden when you meet somebody at that point in time, they don’t have a reference point for what I was doing three years before. All they see is the context that you’re living in at that moment and that is something very important I think because that can change over time but still be 100% congruent at any given point in time and that’s a big part of how I look at tying my life with my business pursuits together. That’s long-winded but that’s the real way that I look at it and I think that’s what the listeners want to hear. Yeah. I think that’s a great point because you’re not compartmentalizing your life in your work life. You’re putting together the interest that you have and making a business out of them while leaving some room for like you said serendipity to happen for different opportunities to develop based upon the things that you’re already doing. I like that word that you use congruency and it goes back into your personality. One of the things that you had in your book was a framework for how to build a business that fits your life and that goes back … I think the word you used there is identity. Can you talk a little bit about that framework and how people should use it to align their business the way they want to live? Can you talk a little bit about that framework and how people should use it to align their business the way they want to live? Certainly. Maybe we can even supplement this interview I’m happy to give away the first 60 pages of Lifestyle Entrepreneur, which really describes this identity and this process in detail but in short, if you just picture a Venn diagram that has three circles that are overlapping and then the center they all have overlapped and the exercise is assigning things that you want to know more about or knowledge that you already have for one, things that you want to do … and how you want to show up and be perceived in the world. Know, do and be. The exercise is just simply write down two or three sentences or phrases for each one of those that’s indicative of what you want to know or learn more about, things that you’d like to do for fun or for business or for personal enjoyment and then what roles you want to play. Do you want to be perceived as a global traveler? Do you want to be perceived as a master coach? Do you want to be perceived as a student of language and culture? When you start to do that, you can see where they overlap and ultimately what I call the sweet spot, what’s in the center that day-by-day or week-by-week would let you fire on all of those cylinders, maybe not all at the same time but periodically one or the other et cetera, that’s a recipe for being excited, having a high level of motivation and an interesting diverse life that’s also factoring into the business. That doesn’t exactly answer your question of how do you build a business based off of that but I think it’s important to do an exercise like this because if you don’t have clarity on those things, then it’s very easy to just create yourself a full-time job and there’s a great saying I don’t know who said it but “entrepreneurs are the only people that are willing to work 80 hours a week to avoid working 40 hours a week for someone else,” right? Right. You definitely want to be able to have that balanced approach. I think a lot of people whenever they hear lifestyle entrepreneur, they might think that you have to have a business that runs online and that’s not the case because you laid out there’s four different types of business that you can have while living this lifestyle entrepreneur … taking this lifestyle entrepreneur approach. Can you walk us through those four types of businesses? Certainly. I think it’s important to point out this point like I think a lot of people especially if you’ve read The Four-Hour Work Week. You think of an online business as something that runs over there. It’s like, “It’s over there.” It just runs on autopilot and that’s not always realistic or even if you build something that has the intention to run on autopilot, you actually have to build it first and that can take six months to a year. I look at it more of like the four types of business are really an online personal, individualized experience which … I’ll just talk through each one and I’ll describe them or an online standardized appearance. The online standardized approach is like eCommerce or selling information products or online training programs or the subscription goods that show up at your door. A standardized offer that somebody came to buy it or they don’t and the transaction takes place online and the fulfillment takes place to wherever they are. The individualized is more of a social media platform or if you’re doing … I had a business I described in the book, we were doing carbon offsets for businesses and households so we had a carbon calculator where you could see your total personal impact or business impact and then purchase that specific amount of offsets. It’s a personalized experience of an online transaction. On the flip side of that are what I call personal delivery. That’s coaching, consulting, live events, training, even multi-level marketing falls into this category although it’s not something I really focus on personally but it’s very possible to have a coaching or a training business just like we’re doing now through Skype taking place from wherever. I’ve done coaching sessions in Hong Kong and in the arctic circle and Norway and many places in between. That’s actually a personal experience more than physical product but still something that can be set up, structured and sold and delivered online in a geographically independent way. Is that helpful? Yeah, definitely because I think it gives people a vision that it doesn’t have to be one type of business that can work in this way. I guess the next question I have is let’s say people have built a business where they’ve in essence created a job for themselves, the business doesn’t function without them being fully in it and they would like to have more freedom in their life and inject more of themselves into their business but that doesn’t hold them down. Is there a way for someone to go back and retroactively fit their business to where it can become a lifestyle business or is it too difficult to do once you’ve already started? Instead of thinking about going back or undoing a lot of things, I instead encourage people if you feel like you’re just spinning your wheels and it’s a ton of work with not a lot of reward to just be really clear with yourself on what are the key activities that generate revenue in your business and what are the parts that only you can provide versus something that can be systematized and delegate. I have friends that have multi-six-figure, some even have a million plus eCommerce business selling nutritional supplements or other skin care products and for a while, they insisted on doing all of the customer support and I was like, “Why?” It’s like one of the first things I’d looked to offload. If you find yourself what are you actually doing that’s taking up all of this time and making you feel so trapped. If you just allow a little bit of trust in somebody else and in the process that you’ve set up, it’s not difficult to hire and delegate functions and tasks. As an example when I had my physical products business, wholesale of USB flash drives, my goal from day one was to do each function of the business enough where I could understand it, describe a process that somebody else could follow and then bring somebody on to fill that role. Within three months, I had divided it into a sales team and a customer support team and then two people that were each minority partners and beneath them, they had contractors that would help out or sales executives that worked on commission and we had totally virtual set-up and my role then as the business owner the entrepreneur was looking at higher level partnerships. How can we partner with a company over a long-term or do a new business development initiative instead of just servicing incoming requests for quotes and sales and doing the fulfillment that was the core part of the business. If you have the mindset of like how do I just ruthlessly systematize what I’m doing and either delegate or be more … just be a little more strict with yourself on not overworking and focusing on what’s actually driving your business forward versus creating busy work, it’s surprising how little real focus and attention and energy it takes to move things forward in business but I think I’m just as guilty of this myself but it’s very easy to just create busy work and feel like you’re working and start to become addicted to the feeling of working because you feel like you’re supposed to or because it’s your business and because who else is going to do it if I don’t do it. I was going to say is outsourcing, systems, and delegation an essential aspect of giving … freeing up your time to be able to have both your business and your life? Absolutely. It doesn’t have to be on mission critical business functions either. For a while, now I do … I run a publishing company, we’ve done 11 books in the last 15 months and it’s really just … I’m the sole owner of the company but with a small team of people that work in specialized areas, we can do book after book and do them right, make them look great, do the book launches, do the book marketing because there’s a process in place and I have a team member or an editor, designer to just see each piece through. Here’s another example. If you’re watching this, tell me if you had this experience. You go to an event or a conference and you’re all pumped up and you meet a lot of people and you exchange cards and you think, “Oh I’m going to collaborate with all these people.” And then the conference is over and two days later do you follow up? Do you proactively write an email to each person and move those conversations forward or does a week pass and two weeks pass and then it’s just almost as if you never met? That was me and I just … I hate scheduling, I don’t like administrative work, it’s not my wheelhouse but when I realized, some people really loved that. Some people like being diligent and organized and structured so I hired an assistant and she is so on top of it. Now when I go to a conference, look at this, here’s a stack of cards. Normally these would have never been followed up on. Now I go to a conference, somebody hands me a card, I put on a table, take a picture of it with my iPhone, text it to my assistant and say follow up with Jill because she wants to talk about me speaking at an event she’s running next year. That creates, it totally sidesteps the whole pain point and actually becomes more impressive because when Jill goes home and checks her email, she sees and email from me and my assistant and I’m still sitting in the conference with them. She’s says, “How did that happen? Wow this guy is on it.” Where can you extract yourself from the things that are agonizing that you don’t like doing and give them to somebody that’s going to love it and be focused or at least willing and capable to handle those functions. That’s a good point because it helps you not only grow your business by moving things forward that you can’t always find the time to do but it saves your energy for being able to focus on a task that you really do enjoy doing. It helps a great deal on a number of ways. I agree. For me now I run my life through my calendar which sounds strange to say because I’ve always been very free spirited but I find that having and I don’t run my calendar. My assistant is basically in charge of blocks of time within my day that I’ve said, “Fill these up with things that will move my business forward.” She helps become a filter through does somebody want to talk about publishing their book? Okay they’re getting on the calendar. If somebody want to interview me for a podcast or a summit, then we evaluate the opportunity and get it on the calendar. The freedom that comes from just waking up, flipping through my calendar on my phone and saying, “Okay, this is what I need to do today. I’ve got three or four main items on the calendar and it didn’t take any extra energy to have that set-up.” That allows me to just show up and focus on being my best on each of those calls, each of those scheduled appointments and not diffuse my energy with ten back and forth emails, getting everything ready or getting all the information ahead of time. Got it. This has been wonderful. I know we’re closing to the end of our time, do you have any parting words of wisdom for entrepreneurs who are looking to balance, have that intertwined DNA of both their lifestyle and their business and not separate, two separate things. Sure. One, thanks for inviting me on Sonia and if you made it this far, thanks for watching and if you find this stuff interesting, we’ll try and get the first 60 pages of Lifestyle Entrepreneur, available for you and you’re welcome to go to www.businessinaweekend.co and I have a three-part video series essentially that walks through this identity process we talked about and also carries it forward into how do you actually structure that into a business idea that fits your personality type. If you feel it, then it’s right and start going after it being willing to know if and when you want to continue going further or say, “That was a fun side whatever.” And come back and refocus on something new. Have a spirit of exploration and have fun with it and thanks a lot. Thank you Jesse, thank you so much. This has been super valuable. You can be a lifestyle entrepreneur and it doesn’t matter if you want to be the CEO of a 500 person company or if you want to be the only person in your business with just a laptop on the beach. It’s totally up to you. To get you started molding your business into something that supports your ideal lifestyle, you first have to be super clear on how you want to live your life. Here’s your assignment. Describe your perfect day. Be specific. Write down where you’d like to be, how you want to spend your time and who you’d like to spend it with. Once you’ve got your answer, come on over to the private Facebook group and let us all know what your utopia looks like. Until next time, keep working on building your dream business so you can make life better. Somebody’s waiting on you. See you soon.